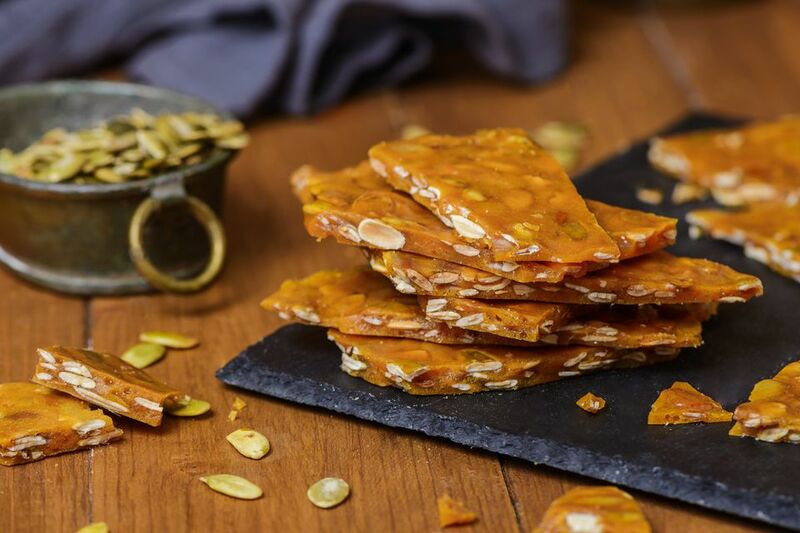 This crunchy pepita brittle is an excellent autumn alternative to the classic peanut version. Hulled roasted pumpkin seeds—or pepitas—make it a lovely seasonal choice for holiday treats and gifts. You can use raw pumpkin seeds as well or the unhulled roasted seeds from the Halloween pumpkin. It's importable to have a reliable candy thermometer for this recipe to ensure the syrup is just the right temperature for the candy. Generously butter a rimmed baking sheet or lay out a large silicone baking mat. Measure the pumpkin seeds and pour them into a small bowl; set aside. Combine the vanilla and baking soda in a small cup or dish and set aside. Combine the water, syrup, sugar, and salt in a deep medium saucepan. Attach the candy thermometer, so it is in the mixture, but take care that it doesn't touch the bottom of the pan. Cook the sugar mixture over medium heat, frequently stirring, until the sugar has dissolved and the mixture reaches 285 F to 290 F on the candy thermometer. Add the pumpkin seeds (the temperature will go down temporarily) and continue cooking, constantly stirring, until the mixture reaches 300 F (hard-crack stage). Immediately remove the mixture from the heat and stir in the baking soda and vanilla mixture, along with the butter. Pour the candy mixture out onto the buttered baking sheet or silicone baking mat. Stretch or spread gently with a silicone spatula if necessary. The candy will set and harden in about 10 to 20 minutes. Break the brittle up into smaller pieces. Store pumpkin seed brittle at room temperature in an airtight container separated by pieces of parchment paper or waxed paper. The brittle will keep for about 2 to 4 weeks. To test a candy thermometer, attach it to a pan of water. Bring the water to a full rolling boil. After 10 minutes at a full boil, the thermometer should read 212 F (depending on altitude), the boiling point of water (check here for boiling point temperature at different altitudes). If your thermometer is not accurate, adjust the recipe accordingly. For instance, if the thermometer reads 214 F, add 2 degrees to the recipe temperature. If it reads 210 F, subtract 2 degrees.